Perfect for male or female! Eyes-catching and Awesome!Great for all parties, night jogging, safety and all kinds of night time fun! Great for all parties, night jogging, safety and all kinds of night time fun! Can be used as Necklaces, Bracelets as well. Also, can be worn on your pets or anywhere you can think of. Perfect for male or female ! 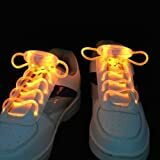 1.Dear friends,the shoelaces which you receive maybe have a little vary from the listing picture, because of different Camera lens, and different light environment. So,if you have problems with the item ,pls feel free to contact our company, we will try our best to resolve the problems . Thanks for your understanding!Appreciated! 2.Because we have five colors in store now ,just as the photos show :Red,Green ,Orange,Blue and Yellow .so dear friends, if you buy it ,could you please send a email or leave a message to me about the color of the Shoelaces.Thanks!